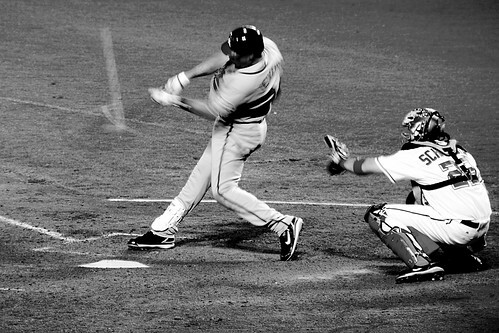 Marco Scutaro, originally uploaded by Dinur. True, I didn’t believe that Scutaro would end up here. But how likely was it, really, that a 34 year old shortstop coming off a career year would turn down a guaranteed third year from the A’s to come here? To judge from the press conference this week, more likely than you’d think. Anyway, it’s all over now but the crying. We’ve got our hundredth shortstop of the post-Nomar era, and at least my prediction that we wouldn’t see Pedroia move west across the diamond is holding up. For now. The remaining question is simple: is this a good thing? The magic eight ball consensus is: cannot say at this time. He’ll be better than our shortstop numbers from last year, I’m sure. Our shortstops last year put up a collective .234/.297/.358, so barring a return of his plantar fasciatis, Scutaro should easily better that line. Even with it, actually. Bill James says he’s good for .264/.347/.381 output in 2010. Defensively, he put up an eye-popping 20.3 UZR/150 at short in 2008, then came back down to earth with a 1.0 in 1252.2 innings last season, with his injury plagued August and September likely a negatively weighting factor. For context, Gonzo put up a 10.5 in ’09. Hardly world-beating, but given what I saw us trot out last year, I’ll take it. In that sense then, yes, the Scutaro signing is a good thing. And the cost – financially – was eminently reasonable. I think Olney mixed up the player and team options here, but the $14 million maximum exposure is cost effective even if, as many suspect he will, Scutaro regresses. But let’s come back to that. The worst part of the deal for the Red Sox is the loss of the first-round pick. Yes, the Red Sox got — or stole, if you’re a bitter Met fan — a first-round pick for Billy Wagner, but that pick was theirs whether or not they signed Scutaro or another Type-A free agent. Few teams have been as productive in the draft as the Red Sox have been over the past five years under recently-departed scouting director Jason McLeod, so the value of a first-round pick to Boston should be quite high, knowing how well they’ve converted those picks into assets. What are we getting for that lost first rounder? Good question. 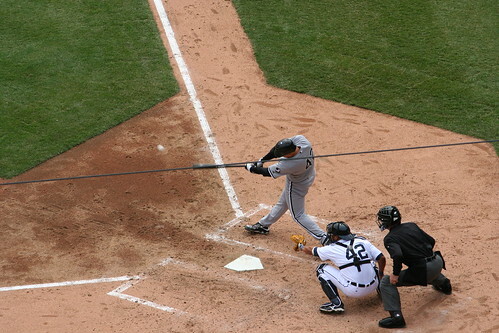 Scutaro fits the profile of what the Sox like in a hitter. This past season, he batted leadoff for the Blue Jays, and he had an on-base percentage during the past two seasons of .362, second among American League shortstops only to Derek Jeter’s .385. Look at some of the more exotic numbers measuring plate discipline, as calculated by FanGraphs.com, and Scutaro’s attractiveness to the Sox becomes even more apparent. He ranked first among American Leaguers in swinging at the fewest pitches outside the strike zone (12.3 percent), a category in which the Sox had three players (J.D. Drew, Kevin Youkilis and Bay) among the top 17. Scutaro also ranked first in the AL at making contact (93.3 percent), just ahead of Dustin Pedroia (93 percent) and second to Bobby Abreu for lowest percentage of swings taken (34.5 percent to Abreu’s 32.9 percent). Even if Scutaro’s 2009 was — as it appears — a fluke year at the plate, his offensive advantage over Gonzalez well outweighs the small defensive disadvantage, leaving the Sox better off and with a player who, with some regression, will still represent a good value for his salary. Scutaro did play the second half of the year with plantar fasciitis that required surgery when the tendon finally tore in September, and it’s possible that the injury affected him defensively; he played better with more range in the field in 2008 and the first half of 2009. He also spent time in Toronto working with coach Brian Butterfield, one of the best infield coaches in the game and the man who turned Orlando Hudson and Aaron Hill into Gold Glove winners (deserving ones) at second base. On the other hand, Scutaro is 34 and has never had great speed, so there’s reason to fear that age and loss of athleticism will start to bring his defense down over the life of the contract. This is a solid move, and the money — whatever it winds up being — is essentially irrelevant because the Red Sox can afford anyone on the market this winter, and anyway Scutaro isn’t going to bust anybody’s budget. In mid-July, Scutaro’s defensive metrics — according to three teams’ valuations — were the best in the American League. Then the foot began bothering him, and the numbers were affected in August and September. Dave Allen penned a masterful breakdown of Scutaro’s game here, and there’s not much to add. He is 34 years old and coming off what appears to be an anomalous performance. His 2010 wOBA will probably land somewhere below league average and his defense is a mixed bag. Scutaro can play average defense at second or slightly below average at short, is 34 coming off far and away a career year at the plate. The net of all of the above? There’s almost no chance Scutaro’s will be as good as he was last year. He’ll still be better – significantly better – than what we ran out there every day last year. This improves the club, and if you can get beyond the loss of the pick, the cost is acceptable. Better, the years are perfect. 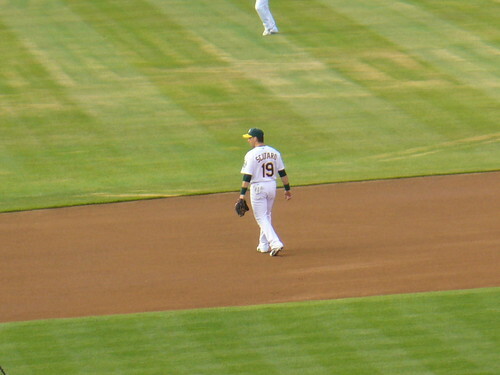 For next season, we have a major league shortstop that is assumed to be healthy, unlike Lowrie. The season after, the club will have options. If Lowrie has a healthy season under his belt, they can let the two battle it out for the starting spot with the loser relegated to a utility role. Five million is a bit much for a utility guy, even for the Sox, but it’s not going to kill you. If, by some chance, Iglesias is ready ahead of schedule, they have more options, including a trade. If it seems like the signing of Scutaro screws Lowrie, that’s because it does, as Peter Abraham notes. You have to wonder whether Lowrie’s window with the club closed this week. It’s reasonable to assume that the front office is in regular contact with Lowrie this offseason, and if they thought there was any chance the wrist would be full speed, I think they would have been more reluctant to cough up the pick. The fact they didn’t speaks volumes about their perception of Lowrie’s current health, and his prospects going forward. In all likelihood, he’ll be a big part of the Sox bench this year, but that’s well short of the club’s – and presumably his own – one time expectations. How they handle Lowrie’s future will in all likelihood depend on how Iglesias hits in his first professional season. If he shows progress and a reasonable approach, Lowrie’s probably bait. If the Cuban is a hacking mess at the plate, one imagines the Sox will keep Lowrie around as a hedge against a delayed arrival of the shortstop of the future, a decline/injury from Scutaro, or both. Scutaro’s a bridge, then, to the future, rather than the future itself. And not a particularly expensive one. We’re a better team, defensively and offensively, with Scutaro than we were without him. How long that remains true is open to question, but given that we didn’t hand him an abominable Lugo-esque four year, big money deal, I can’t say I’m all that worried. 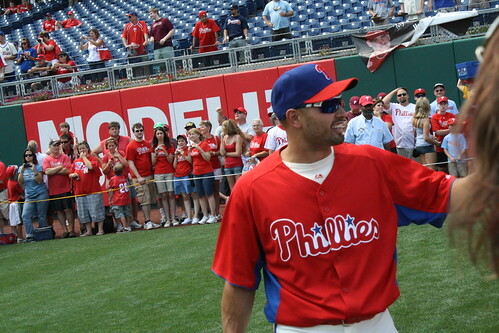 Plus, like everyone else, I can’t wait to play MARCO…SCUTARO this summer. In the wake of the Mark Teixeira signing – and as an aside, does anyone else find it remarkable that Mazz is still arguing that the outcome could have been different, in spite of evidence like this? – and, to a lesser extent, the acquisition and signing of Matt Joyce and Pat Burrell by the Rays, many seemed to conclude that the Sox’ offense would necessarily compare less than favorably to our divisional rivals. Which of course is entirely possible. But I thought it would be interesting to look at the projected average OPS of the anticipated lineups for the three AL East clubs to see how they fared relative to one another. For the comparison, I picked the CHONE projections, not least because they’re available by team. If anyone has the James or Marcel numbers batched I’d be happy to add them. Not bad. Joyce and Burrell are decent additions, and the lineup as a whole should have reasonable on base skills with the exception of the bottom of the lineup (they’re not ordered here). Now how about the big, bad Yankees? I might quibble with a few of the projections, but basically it shows what you’d expect: substantial on base ability top to bottom, with consistent power through the first six spots. But what of the good guys? Are we completely outclassed in this winter of media discontent? Not exactly. What we give up in power, CHONE expects us to make up in OBP. Which is all the more interesting, as one common criticism of OPS is that it undervalues OBP. Does this mean everything’s sunshine and lollipops for ’09? Hardly. First, it’s just a projection. Two, it doesn’t factor in benches. Three, it can’t anticipate injuries. And so on. But it is worth remembering, I think, that the conventional wisdom that we wanted Tex while the Yankees needed him is looking pretty accurate by CHONE’s numbers. Josh Bard, originally uploaded by ewen and donabel. For the first time in recorded history, you may actually have heard it here first. The Josh Bard news, that is. Last I checked, Josh Bard – the catcher we shipped to San Diego after he proved unable to catch Wake – is available. Probably because in 57 games with the Friars, he put up an abysmal .202/.235/.333 line. Not a typo: he really was a .569 OPS player. That said, ‘07 saw him put up a .285/.364/.404 in a tough hitters’ park, and Bill James’ ‘09 forecast is .268/.342/.395. Which may not seem like much, until you remember that Tek’s 08 line was .220/.313/.359. And that Tek’s 09 projection is .238/.334/392. And that Bard is six years younger than Varitek. Moving to improve their depth on the mound and behind the plate, the Red Sox have agreements in place with right-hander Brad Penny and catcher Josh Bard, according to an industry source. I’ll get to the Penny news later – tomorrow if I’m not too lazy – but I’ll be honest: I like the Bard signing. True, Bard is no Martin, Mauer, or McCann. He’s not even a Flying Molina Brother (at least of the Bengie variety). But there are several things arguing in this deal’s favor, most notably the fact that it’s short money and short term, and doesn’t cost us prospects. Our risk, therefore, is minimized and our flexibility to either deal for or develop a long term solution is preserved. 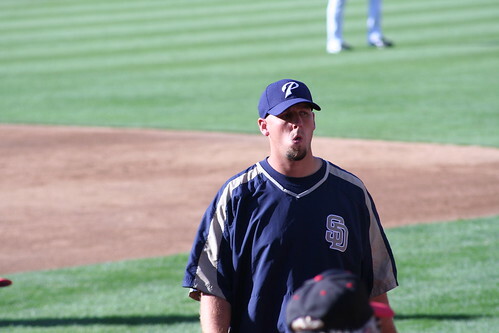 After Bard took to being knuckleballer Tim Wakefield`s personal catcher like a duck takes to being repeatedly poked with a fork, the Red Sox panicked and flipped him to San Diego for his predecessor, Doug Mirabelli. They never could have anticipated he`d hit like he did in San Diego, just as there`s no reason for the Padres to expect him to do it again. Still, Bard`s a true switch-hitter, solid against both righties and lefties, and PECOTA expects him to maintain his new-found plate discipline, so he`ll still be one of the better players at his position. Although properly considered the better-throwing alternative to Mike Piazza on last year`s Pads, Bard didn`t surpass him by much. Throwing out only 18 percent of opposing baserunners isn`t very special, but, in Bard`s defense, he`s done better before; perhaps Pads pitchers need to work on holding runners as much as their catchers need to work on throwing. And – remember, he’s six years younger than Tek – the projections all look ok.
Like I said: no Mauer. But compared to Tek’s .672 OPS last season, even CHONE’s pessimistic forecast looks acceptable. And speaking of Tek, I have to think this pretty much means he’s not back. Not just because McAdam says that the Sox “have all but given up on re-signing” him, but because of the Wakefield factor. Initial speculation considered the possibility of Bard backing up a resigned Varitek, but while I suppose that’s not impossible, haven’t we tried that before? That would leave us with two catchers that have more or less demonstrated that they cannot catch one of the pitchers we’re throwing every five days. From this signing, then, I conclude not that Bard will be the unchallenged starter, but that the second catcher will be someone who can catch Timmeh – i.e. not Varitek. Could it be Kottaras, perhaps? Evan over at Fire Brand had a nice piece looking at this a couple of days ago and built a fairly credible case that Kottaras could be a bigger factor than we might have expected in the catching equation. The signing of Bard, if anything, improves his chances, as he’s now one of the few catchers in the organization with experience catching a knuckleball (in case you missed it, the Yankees signed Cash away from us). Is a Bard/Kottaras tandem the long term solution to our catching needs? Obviously not. But could it provide us with a credible stop gap until such time as we can find one? Seems at least possible. If both hit only to their James projected OPS, in fact, they would have placed 6th and 7th respectively amongst qualifying catchers last season – such is the state of big league catching these days. How you deploy them could ultimately be determined by their play, as well as the pitchers’ comfort level with each. If you weight his experience, and think Bard is more the .285/.364/.404 player from ’07 than the .569 OPS of ’08, you could start him four days a week and designate Kottaras as Wake’s caddy. But given that James projects more offense from the rookie than the vet – an anticipated .765 OPS to Bard’s .729 – it might be wiser to platoon them to some extent. Which could work nicely, because while Bard switch hits, his lifetime OPS is eighty points higher against lefties than righties (.785 to .705). Kottaras, meanwhile, hits from the lefthand side, and his splits show it: career, his OPS is 46 points better vs righties than lefties (.808 to .762). Are Bard and Kottaras the tandem for ’09? Hell, I don’t know. The point here is that if they are, we might not be in terrible shape.